R/S Two 1/8" FPT ports fitted with 90° tube adapters and tube. 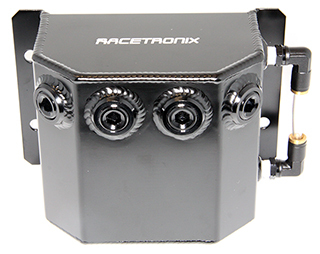 The Racetronix catch tank is a very versatile unit with multiple ports. This allows the user to configure it for the required application / environment. 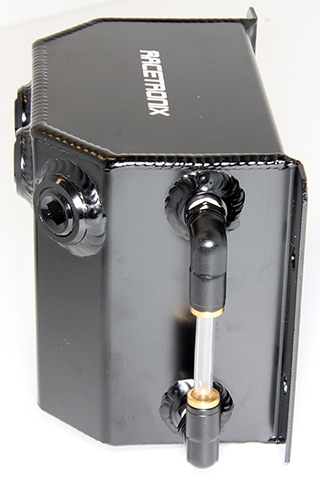 There are four 3/8"-14 NPT ports on top and one on the bottom. The level tube to be located on the right side. 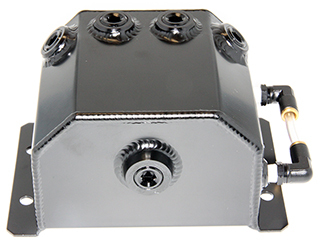 Swivel push-lock 90° fittings allow for quick installation / removal of the level tube. All unused ports are fitted with flush-head 3/8"-14 NPT plugs. All joints are TIG welded and leak checked. Note: Slight imperfections in the aluminum surface may be visible due to the grain and the manufacturing process.